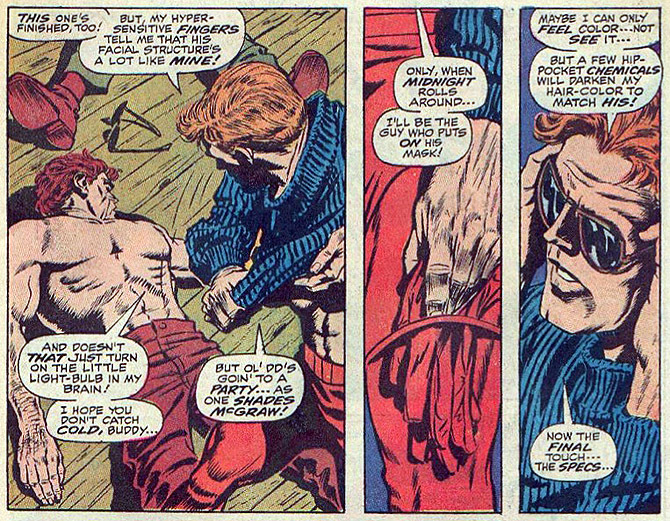 The last time I can remember seeing Daredevil sense color was during Chichester’s run, in Daredevil #339. Unlike the scenes where Matt reads computer screens by touch (possibly my biggest DD pseudo-science pet peeve), the below scenario makes at least some amount of sense and of the four scenes depicted here, this one is the closest to the scientific reality I will cover at the end of the post. So, why does this ability qualify for inclusion in this series of posts? Isn’t there some logic to it? There is. But for the most part, it is based on a misunderstanding. 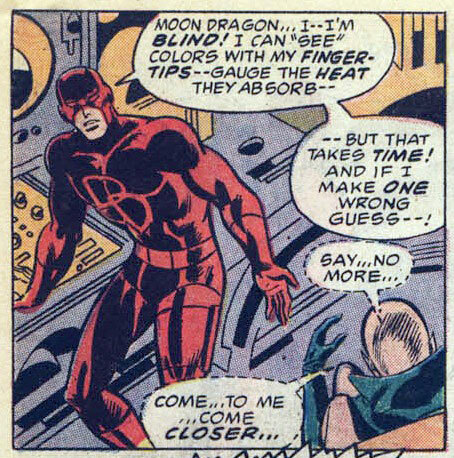 In the last few panels from Daredevil #339, Matt talks about light and dark areas absorbing degrees of heat from the lamp above, and that these are able to give him enough of a difference to discern light from dark. Aside from the fact that he seems to be doing this with his gloves on(! ), this isn’t completely nutty. The key points here being that he has access to a lamp and that he’s only talking about sensing a difference between light and dark. This is no different (well, not in theory anyway) than what we might notice if we put two identical objects of very different color out in the sun for a while. A darker surface absorbs more of the light that hits it than a lighter surface, and the absorbed energy can be felt as an increase in heat. 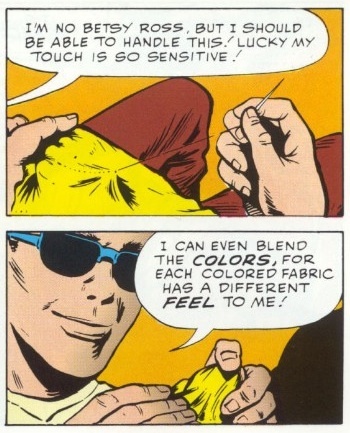 However, this doesn’t make it possible to specifically discern between different colors, no matter what Stan Lee says. Not only do different colors not differ in how much heat they absorb (heat does not equal light), so the implied idea that one might be able to notice a specific amount of it being absorbed when touching a material falls flat. Colors are also not characterized by specific temperatures, whether in the absolute or relative sense, the way they are characterized by different wavelengths of reflected light that our eyes can see. This means that it’s impossible to know, in isolation, what color something is just by touching it. The exact temperature of an object would depend on many different factors, and in most normal circumstances all objects in a room are at whatever the ambient temperature happens to be unless they are exposed to direct light, and the laws of thermodynamics make sure that local temperature anomalies are short-lived. 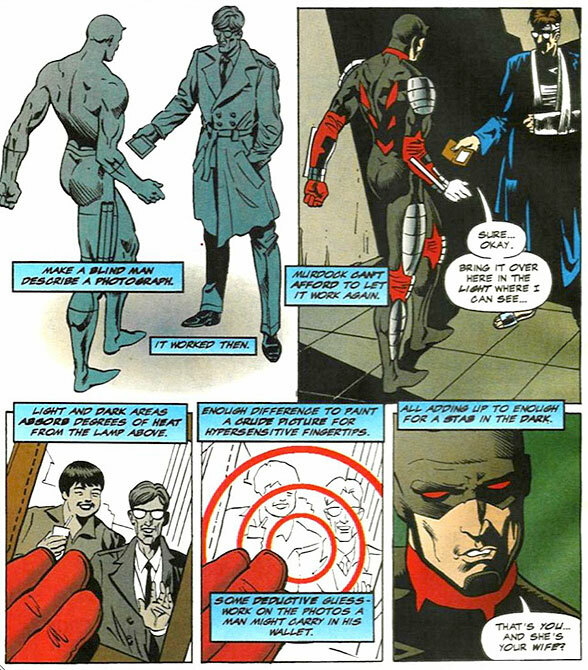 I love the hair dye incident in Daredevil 60 not only because of Matt's ability to distinguish colour but to have had the forethought to carry on his person chemicals that would darken his hair to the EXACT shade of a thug (he didn't know he was going to meet). Now that's impressive forward thinking. screw it, why dont they just say hes colour-blind and leave it at that. I wonder if there are any actual colourblind heroes out there? its kinda like claiming you can taste the difference between different coloured M and M's. You are sort of right. If he has two identical objects but different shades (one dark, one light) and access to a light source, he can tell which is the darker one, but not which color they are. I hope that makes sense. However, different colors don't absorb different amounts of heat. In the dark, all colors are the same temperature, and differences only become noticeable when you subject them to fairly bright light. In a normally lit room, there shouldn't be much of a difference even between light and dark. I'm sitting on a light couch and my computer is on a dark table and any temperature difference between them would be virtually non-existent. And isn’t it interesting how, as DD is fooling Ben Urich into believing he can see, Ben never notices him running his fingertips over the photo like – well, like a blind superhero with an enhanced sense of touch trying to figure out what’s in the photo? And isn’t it interesting how Matt can detect the “areas of hotter and cooler dark and light” through the piece of plastic over the photo – and, as previously noted, through his gloves, as well? Wow, those ARE some sensitive fingertips alright. I know someone who can sometimes sense color by touch. It is not a difference in temperature and it is not only a matter of light and dark. As she explained to me black and white can be easyly confused sometimes (depending on how sencitive she is feeling). She says some shades feel “full” and others fell like more “acid”. Well. Any how she cannot sence allways. It depends on her state of mind or emotional state I dont know. But when she is certain about a color she definnetly gets it.